Of all the rings shown in the image above, all fall into the category of “Fancy Cut Diamonds” — essentially any diamond other than the traditional Round Brilliant Cut Diamond. 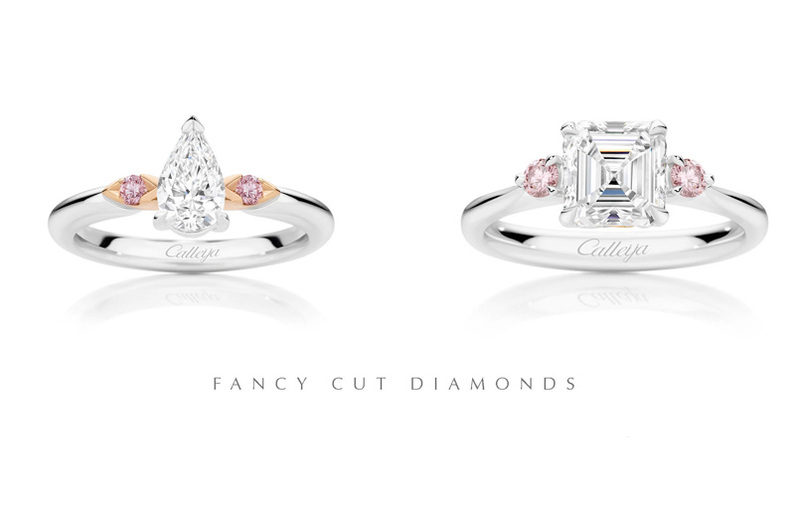 Clockwise from left you can see: Pear Shaped, Square Emerald Cut, Marquise Cut and Radiant Cut Diamond Rings, however others include Cushion, Heart, Princess Cut, Asscher, Emerald Cut, Baguette, Trapeze and Oval — all part of the “Fancy Cut Family”. These diamonds have earned their place over decades, from a combination of changing fashions and the evolution of gemmology, particularly with the aim of limiting diamond wastage whilst still ensuring the jewel’s optimal brilliance and scintillation. The diamond grader will inspect the loose rough stone and determine which cut is best to garner the maximum potential for every jewel — they are truly treated as individuals. And herein lies the fascination, because we are all drawn to different shapes and sizes for reasons sometimes unknown to us, and in essence the diamonds we choose are as individual as we are. Why are you drawn to one shape over the others? If you are interested to learn more about Round vs Fancy Cut Diamonds, make an appointment to meet with one of our dedicated Calleija team members, who would be delighted to share their knowledge and expertise. They can help guide and assist you in making one of the most important decisions of your life. Feel free to leave your comments below on which cut you like the best, or with any questions you might have regarding Fancy Cut Diamonds.